The Tallest Man On Earth is playing a show at Union Hall on April 14th (tickets are on sale). That’s one day before the previously announced show at Bowery Ballroom (tix still on sale). Both NYC shows are with California’s Libertines-U2-like band, Red Cortez (formerly The Weather Underground), who, as recently pointed out, are now on tour with Morrissey (sort of). After Morrissey-touring, and before they hit the road with The Tallest Man, Red Cortez will play around six shows in Austin for SXSW. 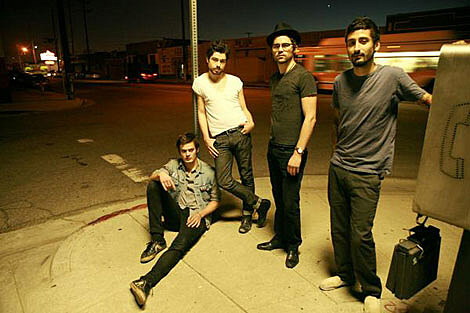 Those include the My Old Kentucky Blog official showcase at Radio Room, and Mess With Texas. 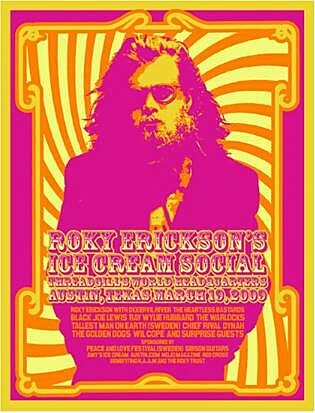 Roky Erickson, Austin’s own pioneer of psychedelic rock, songwriter and front man for iconoclastic 13th Floor Elevators, will host his seventh annual Psychedelic Ice Cream Social with performances by Erickson (performing with Okkervil River), Heartless Bastards, Black Joe Lewis, Ray Wylie Hubbard, Tallest Man on Earth (Sweden), Dynah, Wil Cope, The Golden Dogs, Warlocks and Chief Rival. Tickets are $25, available at Frontgate Tickets. HAAM, the Health Alliance for Austin Musicians, will receive a portion of the proceeds.